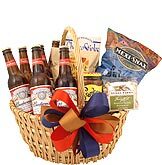 As if a six pack of Budweiser isn't enough to tell someone that you're thinking of them, this loaded basket backs up that statement with Gourmet-quality snacks. Your recipient may choose to share their treats with a friend, or they may hide away and indulge on their own. Either way, they'll know that you're right there enjoying the moment with them. 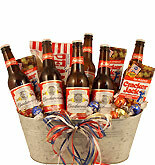 I ordered a Budweiser gift basket for my sons birthday. 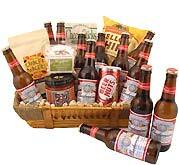 It came in a real nice basket. It had real nice snacks plus the bottles of beer. First time ordering and I was very happy! !